Hugh + Megan tied the knot at Victoria Park Golf Complex. What a gorgeous sun soaked wedding day for a beautiful little family! Megan fell in love with the Milly gown by Mori Lee. – a dress guaranteed to bring a smile to your face! Our breathtaking bride also opted for the striped colour-way. The combination of bountiful cascading ruffles with a classic v-neck is simply unbeatable. 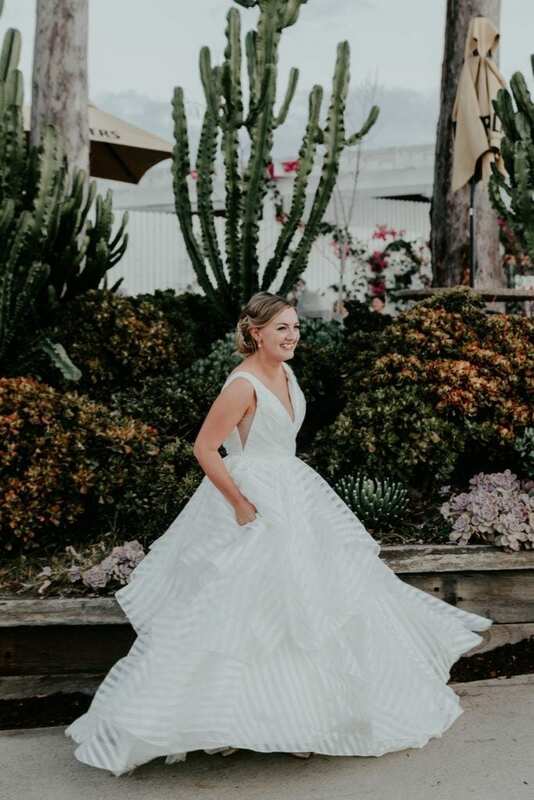 Megan’s striped version added an interesting twist to a timeless ballgown look. Megan said she loved her gown because “It was a little different, but still elegant.” She also loved the fact that it was comfortable too (a must for such a big day!). Megan finished her show-stopping ballgown with glamorously tousled hair swept into and up-do and fine drop earrings. Her beautiful bridesmaids continued the unique styling theme with mismatched dresses in rich jewel tones. This was perfectly partnered with bold and colourful bouquets by The Little Flower Market. Megan wears striped Milly by Mori Lee.